I finally got to break in the new gun. 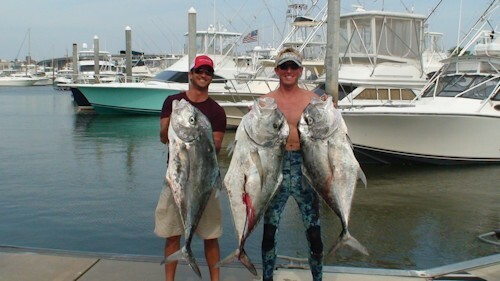 I shot a couple 30-40 lb amberjack to test the aim of the gun with the smaller 7.5 shaft with three bands. I shot about a foot low. Should I only shoot 2 bands with the smaller shaft? The next trip we were hunting African Pompano and I shot at one with my 120 riffe and it deflected off the hard bones of the big pompano. I switched guns and on my first breath I drilled a 35lb african pompano. I thought I missed, then the float line began ripping through my hands. The Hybrid had punched clean through bone and flesh and kept going. After a battle with some pesky sharks I recovered the fish with out a scratch. Then my buddy made a drop with my gun and he came back to the surface with a huge grin as the buoy shot by us! 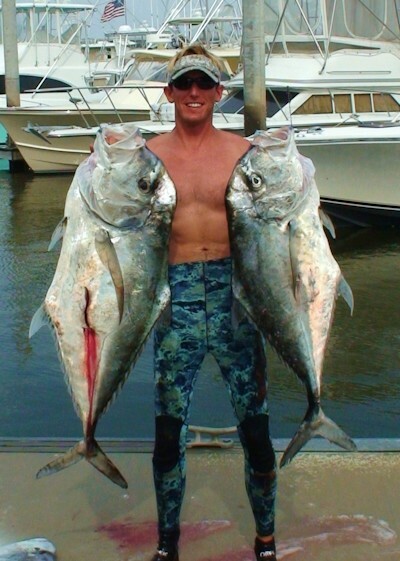 He got a twin african pompano! The african pomapon had been a goal of his for the past year and had proved elusive! After a bit of celebrating, I made a few more drops down to 60ft in poor vis only to drill an even bigger 40 lber. Then I had a nice wahoo stay just out of range for 10 minutes. Thanks so much for the gun, maybe I'll see you at the expo if I dont have to fish. We might make weekend trip down to Blue Wild.